The Beast of Gévaudan, myth or reality? Interlocutor: Now I want to move on to another topic to conclude the session. 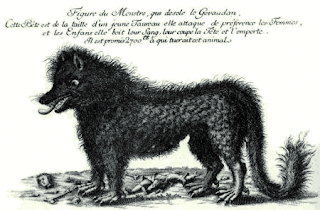 I want to talk about what has been called "The beast of Gévaudan." Johnakan Ur-El: That animal really existed. It was a genetic experiment made on a wolf puppy by extraterrestrials, and it was raised by people with lust for power that had it locked in a cave that gave to the bottom of a castle. Interlocutor: And is it the one that was finally killed? Johnakan Ur-El: Yes, but was not killed by a peasant as they say, but rather were the inhabitants tired of the outrages assaulted the castle and they cornered the animal in its own cave, they hurt it deathly. It was several days moribund and it finally died. Interlocutor: Where did these aliens come from? Johnakan Ur-El: They came from a star located 279 light years called Aldemar. Interlocutor: What number does the planet have? Interlocutor: These aliens, then, came to this planet, they captured a wolf puppy and they experimented with it. Is it correct? Johnakan Ur-El: Correct, and they developed a more intelligent animal than the common wolf. With this story they made books and even a film. Interlocutor: Did anybody give in the key that it was an extraterrestrial experiment? Johnakan Ur-El: Not at all. Interlocutor: Was it about a breed with another animal? Johnakan Ur-El: No, the experiment was made with the DNA of an animal from Aldemar 4. Interlocutor: There was no fertilization, then? Johnakan Ur-El: No, there was no fertilization. Directly with a technology of them, using an apparatus of radioactive type, they impregnated the wolf puppy with DNA of an animal of their planet; finally it grew up in gigantic proportions. It was tamed by a certain nobleman with lust for power that used it to murder their enemies. This means that the animal not only killed women and children. Interlocutor: It was said that hunters from England came to hunt it. Johnakan Ur-El: It is true, but the beast always escaped. In an opportunity it faced an entire army of more than thirty people and it killed almost all of them. Interlocutor: Is it true what they say that it was big as a cow? Johnakan Ur-El: Yes, but with more agility, besides it was a carnivore. Compare it to an enormous lion. The same nobleman who had it in his power suffered in his flesh his ferocity, because it tore his eye and part of his face and he covered with a mask. Interlocutor: Did they connect this nobleman with the beast? Johnakan Ur-El: Finally they did and the same peasants that killed the animal also murdered him. Interlocutor: Needless to say that this nobleman never connected the animal with extraterrestrials. Johnakan Ur-El: Of course not, and even less in that time. Interlocutor: Is there something else to say about this? Johnakan Ur-El: No, nothing else. Interlocutor: Would it be possible to ask one more question? Johnakan Ur-El: No, because the vessel is very tired. Interlocutor: See you later, Johnakan and until the next session. Johnakan Ur-El: I give you a very big hug. This entry was posted at Monday, May 04, 2009 and is filed under Cryptozoology . You can follow any responses to this entry through the .